2005. Mixed media, dimensions variable. - Artwork "Hacking Monopolism Trilogy"
- Washington Post, interview, 2014, U.S.
- Boing Boing, review, 2011, U.S.
- ArtForum, review, 2006, U.S.
- Village Voice, review, 2005, U.S. In this artwork, revenue was generated by hacking the Google “AdSense” initiative. Bots were created to automatically click on banner ads placed on a network of hidden websites. The money from the scheme could be used to buy Google's shares and hand them over via GTTP Ltd., a firm set up for the artwork, which could distribute the shares to everyone and turn Google into a public company. By establishing this circular model, the project addressed Google’s monopoly over control of online information, internet advertising, and its large economy. In response, the German Google legal department sent a letter to the artists threatening legal actions and requesting reimbursements for the money earned from the scheme. Co-authors: Alessandro Ludovico and ubermorgen. PAN, Naples; MoCA Taipei; Derivatives, Madrid; Museum CCA, Hangzhou. 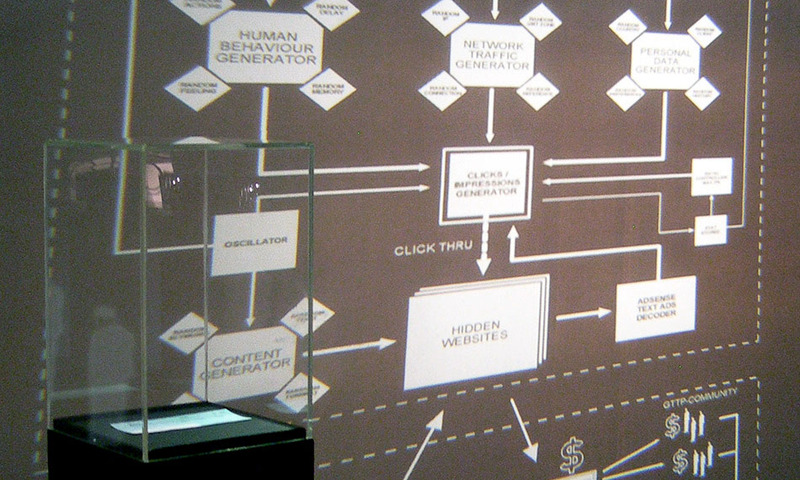 Commission, Rhizome, 2005, New York - U.S.
D.I.Y. Do or Die, exhibition at IAO Gallery, 2006, Oklahoma - U.S.
Chico.art.net, exhibition at California State University, 2006, Chico - U.S.
Rhizome, online exhibition at New Museum, 2006, NYC - U.S.